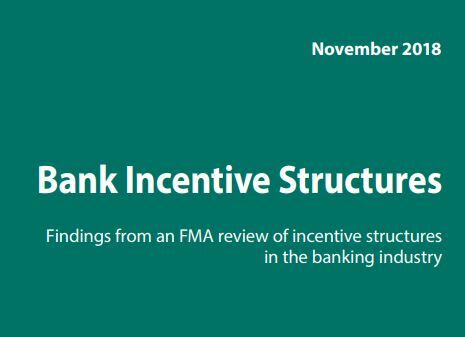 On 5 November the Financial Markets Authority and the Reserve Bank released their joint report into bank conduct and culture in New Zealand On 15 November they released another report into bank incentive structures. Both reports are highly critical of banks’ conduct in New Zealand, find most if not all wanting in terms of their culture and conduct, measures in place to mitigate poor conduct, and the responsibilities of senior bank officers and of boards. While everyone seems to accept the findings of the reports, no one yet seems to want to ask the questions around making it right. ANZ New Zealand posted a profit of $1.99 billion in the last twelve months, that’s around $5.4 million dollars a day – profit! Should ANZ be required to allocate a proportion of its profits to making it right for the New Zealander who, to be blunt about it,have been screwed by the greed of ANZ and other banks? ANZ was quite happy to incentivise and pressure its staff into making sales that should never have proceeded and now it needs to make this right. In 2004, I guaranteed my partner’s company for a house for our daughter when we moved away. That property was sold in 2005 and I thought nothing more of it. At the same time my partner was recovering from a serious head injury. When she was working her income was less than $50k a year and income from her company was limited, less than $10k a year. Still ANZ, from 2005-2009, extended credit to her that, by the time I found out about it at the end of 2013, had accrued to $408k. I don’t not believe that she is responsible for her actions in this period. If I did, then I would be taking the appropriate actions. When I challenged ANZ over this, it said that it had no authority to discuss this with me. That was not true: the loan documents include a specific clause enabling disclosure to guarantors and the Privacy Commissioner also ruled in 2012 that this sort of information can be considered personal information for the guarantor. ANZ said that the Credit Contracts and Consumer Finance Act (CCCFA) prevented it disclosing this information.Again, this is untrue: this Act only applies to personal lending and does not mention company lending at all. To support its position that guarantees are treated differently that security, ANZ then made up information that it attributed to the Code of Banking Practice. Even if that Code did say that, ANZ’s guarantee and loan documents clearly define security as including guarantees. Under the Code of Banking Practice, ANZ has an obligation to only extend credit if it is satisfied that the person borrowing the money can reasonably pay it back. Under the same Code it also has an obligation to tell people who have offered guarantees and other security of new or additional lending against that guarantee or other forms of security. The Code also includes a general obligation for banks to act fairly, reasonably, ethically and consistently. While we might agree that they are consistent in their conduct towards customers, the recent reports from the FMA and Reserve Bank find that ANZ et al fall short in acting fairly, ethically and reasonably. Who will hold them to account for their actions? The reports find the regulatory frameworks in New Zealand for banking are weak. In part this may be due to gaps in legislation and culture of ‘not our problem’ – have a look and see how many government agencies with a regulatory output have more content on their websites about what they don’t do versus what they actually do. From my experience with these agencies, this is largely due to inadequate leadership and an unwillingness to get into the fight. Nowhere is this more apparent that within the Office of the Banking Ombudsman. Although not part of Government – something I hope you will consider changing – this office should be the primary watchdog to safeguard ordinary New Zealanders against predatory banks like ANZ. In November 2016, I submitted a detail complaint (attached)with support documentation to Office of the Banking Ombudsman which initially rejected it out of hand. After three months, it produced a single page response(attached) that did not address any of the issues raised. Acting on advice from the Office of the (real) Ombudsman this year, I submitted a complaint to the chair of the Board of the Banking Ombudsman. Although she did appoint a QC to review my case, he was specifically limited to only review the process applied by the Banking Ombudsman and not the actual issues raised. ANZ was scheduled to forcibly auction my home on 8 November.I cooperated fully with the real estate agent as, if the sale proceeded, it was in my best interests as much as ANZ’s for the auction to achieve the best possible result. That auction was cancelled an hour before it was due to proceed. I believe that ANZ did this to prevent 1 News screening a story on the auction that night. ANZ did not communicate with me at any time to advice of the cancellation, the reasons for the cancellation or what would be happening next. A week later, the real estate agent called me in tears after she had found out my home was instead to be sold by auction. I don’t believe that I was meant to know about this til it was a done deal. That tender closes 4PM Friday 30 November. There is probably not much that can be done to deter ANZ from its course this time. Like most bullies, the only things that put it off are a good hard punch to the nose, or being publicly embarrassed. To that end, if you would like to help, please do not go off and punch a banker. Instead, you might wish to ask the Banking Ombudsman or ANZ if they would like to offer some comment on the issues raised in the attached complaint (sorry, it is a bit chunky as there are a lot of issues) or ANZ’s conduct since I first challenged it in 2013 (yes,five years ago) and over its conduct of the tender. Contacts for the Banking Ombudsman are Nicola Sladden nicola.sladden@bankomb.org.nzor for the chair of the Board, Miriam Dean miriam.dean@barrists.co.nz. Unfortunately I do not have any direct contacts with ANZ other than to direct you towards its totally inappropriately named Customer Financial Well-being Unit. Longer term, please consider how best predatory corporates like ANZ New Zealand can be held accountable and required to make good, as best they can, the damage their greed has done to so many ordinary New Zealanders. establish a Royal Commission to peel off the scab of banking in New Zealand. I do not believe for one second that the Tasman Sea is a barrier adequate to protect us from the behaviours now being exposed by the Australian Banking Royal Commission. This entry was posted in Personal, The Thursday/Friday War and tagged ANZ, Banking Ombudsman, banking practice, Financial Markets Authority, Raurimu Lodge, Reserve Bank by SJPONeill. Bookmark the permalink.